“[There were] eight of us and I was the youngest. [My mother] was more or less an invalid after I was born, she wasn’t able to cope with me and four brothers and dad. My next sister was 11 years older than me and she took the brunt of it and that’s how they managed until I got old enough to work and then I had to do my share. I was nine when we moved to Home Farmhouse. I remember seeing it for the very first time, honestly, the previous tenant kept chickens in the attic. My sister didn’t know how to start quite how to clear it out so what she did, she got a bucket and brush, she swept from the top right to the bottom all through before we could do anything. It was very hard work for her. [The cellar] was open, if you had a drink too many you could have fallen down there. After potato picking we always used to keep enough in the cellar if somebody said ‘can I have a bag of potatoes?’ [Once] I went to fetch some potatoes for dinner and I picked up a toad, I didn’t stay down there for very long”. “[Mother] was kitchen maid. [at the Hall]. I used to deliver milk there when Lord Charles had it. It would be Sherbrookes when mum worked there. It had a big scullery with those big Yorkshire stone slabs, next to that was a big kitchen and then you went through a door into the servants hall. Yes it was a massive place really, well to me it was. That’s how dad met mum with him being stable boy then, and they married and went up to Pudding Bag [a remote and isolated cottage beyond Fallows Farm, some two miles from the village]. They [my parents] very often used to talk about it but I’ve never really seen it. They often said there were wild cherries and a proper little orchard but I’m glad I didn’t have to live up there. When the Commander [Mortensen] was alive he had a road made from [Fallows] Farm right through past Pudding Bag and out onto Greaves Lane”. “My grandmother, my dad’s mother lived where Des [Palmer] lived till not long ago, [Wesley Cottage] and that was a chapel at one time. She was a widow, and she’d got a private income, I think she had about two pounds a week that had been left to her, so she was well off compared with working men. So I think that’s probably where dad got his training from”. 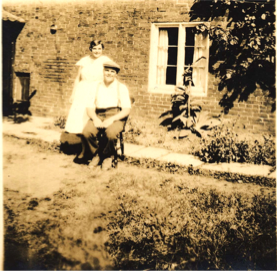 [Father took on the tenancy of Home Farm]. He was doubtful about it, he wondered if he would manage it, if it was too big for him, but Captain Sherbrooke persuaded him to take it and he did and he never looked back”. “[Lord Charles Cavendish Bentinck] often used to walk me to the gate from the Home Farm yard into his courtyard where his clock is there. He would often come and visit my dad as well when he had finished work. He would come and say ‘is the old man in. Ethel’?, He was older than my dad”. “As soon as I left school I had to [help on the farm]. We built up quite a good farm. [Milk] was a mornings job and then some of the customers were delivered twice a day. They kept the [butter] churn right until we had the farm sale at Home Farm, a great big barrel on an iron stand and I can remember my mother saying to me, ‘do you know sometimes I turn that handle with a baby in one arm and turning with the other making butter’. Dad used to take it to Nottingham market every Saturday on horse and cart, or pony and cart, butter and eggs”. “[I had] a bike [and Doughtys] made a box to put on the carrier at the back and had a special bucket made [for the milk] and a thing to hang the measures on inside. When I’d sold that I went back up to the farm for a re- fill. What with the milk round and cleaning of the utensils and whatever, they were all sterilized every day in a copper, it was a full time job. Sometimes I just used to feel a bit niggly, when my friends were going out and I couldn’t, you know it wasn’t convenient for me to go”. “I was quite happy at school, I didn’t want to leave. There were some nice teachers, what I remember of them. I used to like writing essays and I remember Vicar Hunt, used to come twice a week to take scripture with us and one essay that we were given to do was a ghost story and I did this and apparently they kept that essay for years after I left school. [at 14]. I stayed at home, I never had a job, outside sort of thing, I never had a pay packet. I could never ever remember being unhappy about things”. “When the buses first started running [from Nottingham] to Oxton, we were living down Water Lane then so I was only a child. They used to leave them in the yard down Water Lane for quite a few years because they had no garage. There was always two buses to stay the night in the yard, father sort of rented it out to them you see. Then eventually they built a garage at Calverton. Dad used to moan because he always had to wait for his garage money. In fact he had to go to Beeston and fetch it sometimes, because old Mr. Tom Barton wasn’t very good at paying and he couldn’t even write his own name, its unbelievable isn’t it? “We had a bit of everything, we had pigs, sheep, horses, yes it was a mixed farm. Father would never let one [lamb] die, if one was rejected or just been born and the mother had died he would bring it into the kitchen, he wanted a clean piece of material to rub it with and he knelt in front of the fire and rubbed and rubbed and rubbed away at the lamb until he got it going. We had a bull, five horses, sheep and pigs [and hens] for our own use”. “[Father] took us all into partnership eventually. Harry was to do with the beasts, George was the shepherd and Bill and Alf used to be ploughing with horses and then of course when we got tractors it was tractor work, but they each had their own job. At busy times, like harvest they helped one another, they all mucked in together and it was really worked out proper, each knew what they had to do. It was team effort, father was like that, everything had got to be done properly, like the machinery used for the season., nothing was allowed to be put away until it had been cleaned down. As he got older when he wasn’t working he’d got to go across to the farm yard after the cows had been turned out and get a yard brush and sweep every little bit of straw, he couldn’t bear to see bits of straw dotted about on the farm yard. [The horses] were immaculate. They’d start work the same time every morning, whatever they were going to do, between seven and eight when it was light mornings and they’d always got to finish in the afternoon. They would have to be home at 3 o’clock whatever, and my brothers had to see to them, brush them down, feed them and then they could come home and have their dinner but never before the horses had been seen to, never! “I can remember the first tractor we had. It hadn’t got rubber tyres on [so] they weren’t allowed to bring the tractor from Home Farm across the road up to the fields, they had rims to put on them, that’s right, that was before the rubber tyres came”. “As time went on, my eldest brother was very ill, he was ill for twenty years. George [brother] was finding it hard, and he said to Admiral [Sherbrooke] one day that they were thinking about giving up and would he take Home Farm off their hands. He said, ‘I’m so sorry but I’ll tell you the truth, I’ve always wanted to farm Home Farm my self’. Because he’d retired then you see. Mind you, they didn’t keep cattle, it just went to one thing or another and then they started selling the buildings[which were] made into bungalows or whatever”. ” Before the War came, there were first aid lessons, I think it was in the old tin hut, but I took that course then I took home nursing and then of course when war came, when it was my turn to register, my dad said ‘for goodness sake, don’t tell them you’ve done home nursing and first aid and that because you’re needed at home’. I was so upset, that was what I was going to do, I wanted to go into nursing. I thought ‘well I’m needed at home and that’s it'”. “My sister [and I] at night used to watch [the bombers] coming over the hundred acres [field], there looked to be hundreds of them. It was quite fascinating really, but with being young you don’t realise the horror of it. The by-pass wasn’t made then and we used to get the convoys through the village. Often they’d line up and have a break. Father, he’d come in and the soldiers would be out side saying ‘can you make some tea, can you find us something to eat?’ We’d have the kitchen full of soldiers time after time, I suppose he thought he was doing his bit, and they seemed so nice you know, so appreciative. They would come crowding in, it was standing room only”. “Our old nurse, Nurse Knight, she was a dear old soul, she attended my mother for years and years every day. She lived where Jonathan Teare lives [in Sandy Lane] and she did Oxton and Epperstone. She used to say ‘Oh I love going to Epperstone during the summer if I’m called out at night. I love it going past the Park, I always hear the nightingales’. She said to me once, ‘never get married Ethel, never get married’. ‘I don’t like men’, she said, ‘I don’t mind baby boys and I don’t mind the old men but it’s the ones in between’. She really was very attractive, but you never saw her out of uniform. She was a midwife, and everything combined. The doctor at Epperstone, was our doctor, Doctor West, he was an old man and you know, he often would visit at midnight on his calls, he was so slow”. “[Tom, husband] came as underkeeper at the keepers cottage. It was pulled down when they built the new one. Father used to say the keeper’s house, Doughty’s house and one down Water Lane were all built at the same time by the estate workmen. “We were going out together for about three years I think, he’d been here a couple of years before [that].He got this job [on the] Welbeck [Estate] because they were desperate for a keeper at Mansfield. We had got to wait for a reference from Lord Charles with him being away and then it was all go then, just a fortnight, we had to get a special licence. We married early in the morning, 23rd March  and off to Mansfield to start work. The following 23rd March we had that nuisance Richard! [Sylvia was born] in April, there’s four years difference between them”. Ten years later [we came back to Oxton]. [Tom] said ‘I don’t know if I’ve done the right thing but I’ve taken the head keepers job, do you want to go’. I said ‘where ever your job is, it doesn’t matter to me, its your job’. I used to love to watch him [Tom] training [the dogs], It was always Labradors. It really fascinated me, to see how they look at you and wait for command. And yet he was never cruel to them, and do you know anybody’s dog took to him. We enjoyed it [at keeper’s cottage] and Tom liked it. 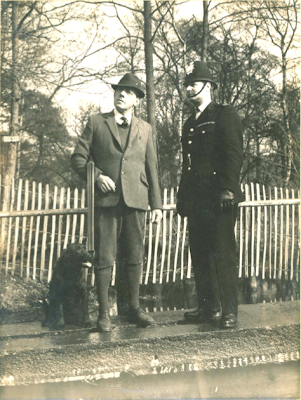 He [became keeper to] Oxton and Gonalston for a few years. He said ‘really I think I like Gonalston estate better than Oxton, its so quiet, its cut off from everywhere and it’s a smaller estate’. They worked together Tom and [P.C.] Rolfe very well. There were always police at our house, if they wanted a cup of tea or something they knew where to find us”. “When we first came to Oxton, Tom used to like to rear the pheasants, he didn’t rear many because there were such a lot of wild pheasants. He didn’t like incubators and he used to go round the farms for miles around, getting broody hens. Tom, he was old fashioned I suppose, he thought it was better to have them naturally, which it is really because they’re tame today aren’t they? He hated it when it came to shooting time and we had to shoot the birds round about because so many stayed around. He used to say ‘I do hate killing these birds around here, I wouldn’t do it if I could help it”. “[Our son Richard trained with the Doughtys]. He said ‘I want to start on my own’. I said ‘there’s something to be said for a pay packet you know,’ but he did. He’s turned lots of work down because he didn’t want to get any bigger. [His workshop is in Home Farm and] he has a bigger one at Epperstone”.